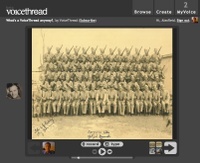 Alan Levine (CogDogBlog) writes about an interesting new app called Voice Thread. Voice Thread allows users to add audio and/or text commentary to an image. As in this thumbnail, one could imagine every person in this photo potentially adding his own story. Below you can see my first attempt at a Voice Thread, which deals with writing technologies. It would be great if you wanted to comment on it. I’ve really just laid out some preliminary thoughts. However, I think it might be interesting for my class on writing in cyberspace to make use of this application to have a discussion about shifting writing technologies and communication practices. Why does Second Life look so much like Real Life?